SOAPBOX CREATIONS: Maile Belles Returns! Today is a fabulous day at Papertrey! Maile is back with an amazing group of stamps and dies that you are going to love....and I can't forget to mention this amazing new paper! 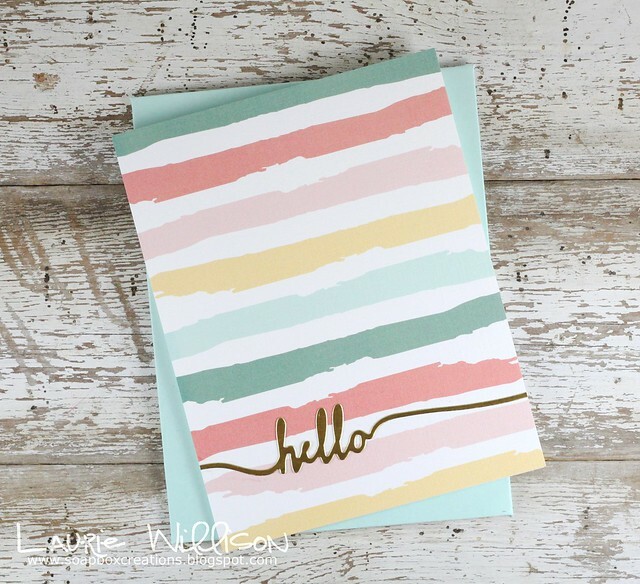 This card could not be more simple but it's Maile's new Watercolor paper that packs the punch. This 4 1/4" x 5 1/2" paper is just perfect for a card front. I used one of her new dies from the Swoosh set to add in a gold sentiment. Of course, I had to make a match envie, too! And that's it! Super CAS! Stop over to Nichole's blog today to see more about Maile's new stuff! I can't wait for you to check it out! Stop back by soon for more PTI Anniversary goodness! Thanks so much for coming by! I adore this new release. Can't wait to use those swoosh dies! Your card is "simply" beautiful! Wonderful card. I love that Maile's paper is so perfect for a quick, simple card. Love it! This is beautiful! That gold accent is fabulous. And I love the Swoosh dies! Oh, this is gorgeous, Laurie! Beautiful and simple card. Love the colors. I love that paper and the simple - yet elegant - design of your card. That die cut looks phenomenal in shiny gold. I love the gold, this is pretty Laurie!! So simple, but I love it! The paper is so cute! L.O.V.E.!!!! So simple and sooooo totally fabulous! Very striking, Laurie, with your gold sentiment on that pastel card front! Beautiful card! 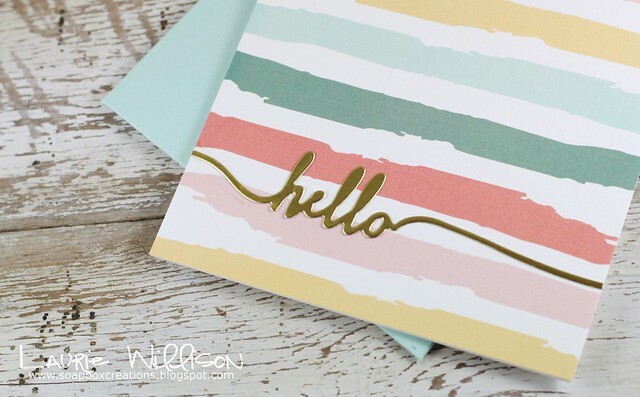 Love the gold sentiment and the pretty colors of the cardstock. Is your envelope made from PTI cardstock because it matches so well...or is this a new product?